"Today we are excited to announce the Star Wars? 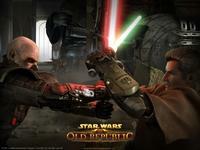 : The Old Republic? Weekend Pass Free* Trial. Now for a limited time, you will be able to live out your very own Star Wars? saga with thousands of other players for free! With the Star Wars: The Old Republic Weekend Pass Free Trial, individuals who don?t already have a previously-active Star Wars: The Old Republic account will be allowed to see a portion of what the game has to offer, free of charge, with no payment method required, for up to four days! Individuals who take part in the Weekend Pass will be able to experience the opening adventures of each of the eight character classes in the game, exploring both their Origin World and their faction?s Capital World. Additionally, Weekend Pass players will have the chance to face off against other players in PvP Warzones, or join up with friends and play through a couple of early faction-specific Flashpoints in the game, The Esseles and The Black Talon. The Weekend Pass Free Trial opens Thursday, March 15th, 12:01AM CT / 5:01AM GMT and ends on Monday, March 19th at 2:00AM CT / 7:00AM GMT. To learn more, visit www.StarWarsTheOldRepublic.com/weekendpass and come back on March 15th to create your account, download the game, and begin your free trial! Have questions? Visit the Weekend Pass FAQ." Click here for the full announcement, complete with terms and conditions.